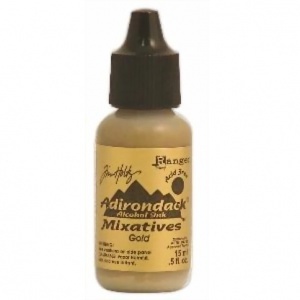 Adirondack Alcohol Ink Metallic Mixatives are luminous, fast drying, acid free inks. They're specially formulated to create metallic highlights when combined with Adirondack Alcohol Inks. Use them on all non-porous surfaces such as light or dark gloss paper, dominoes, glass and other slick surfaces. This one comes in Gold, other metallics in Silver, Copper as well as Pearl are available separately.